All of the ‘cool kids’ in Des Moines have been saying “No” to Constitutional Carry for a long time -– but now it is our turn! The members of Iowa Gun Owners sent a deafening message last year to gun-grabbers as they defeated 6 of 6 anti-gun incumbents in the Iowa Senate: If you mess with our gun rights, you’d better look for another job! In the wake of the November 2016 elections, the pathway for Stand-Your-Ground law was cleared and Iowa Gun Owners hammered that bill into law earlier this year. Next up is none other than Constitutional Carry, the bill that every single anti-gun legislator in Des Moines is committed to opposing as hard as they can. That’s why I’m counting on your help to ensure we keep up our momentum! 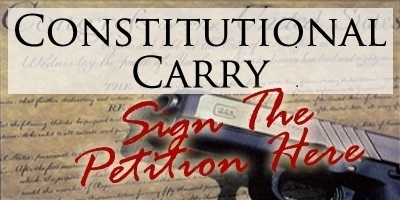 So please sign and submit the Constitutional Carry petitions to your State Representative and Senator that I’ll link you to below! More on that in a minute. As you’ll see, these petitions simply urge your State Representative and Senator to cosponsor the Iowa Constitutional Carry Bill. With your help, my goal is to spend this summer and fall gathering up to 100,000 petitions in support of Constitutional Carry, to deliver to our General Assembly as soon as they go back into session! Believe me: we’re going to need every last one. Constitutional Carry law would simply restore the right of every law-abiding Iowa citizen to carry a gun to protect themselves and their families — WITHOUT going through a bunch of bureaucratic rigmarole! In Maine, it passed with a Democratic State Senate. In Missouri and West Virginia, it passed with a Democratic Governor. So why can’t it happen here, with GOP control of Des Moines? So please, take a moment to sign your petition in support of this critical legislation right away! Sometimes, they even work with gun-grabbers to pass new anti-gun schemes, as we’ve seen over the last couple of years as the House Leadership tried to institute a database of all permit holders in the state! The good news is that with the majorities in Des Moines today, your pressure could be the final ingredient we need to make Constitutional Carry a reality. Just like we proved with passage of Stand-Your-Ground –- your pressure can have an enormous impact. With a tidal wave of grassroots support from good folks like you, I’m confident we can force votes in BOTH houses of the General Assembly on Constitutional Carry. They haven’t forgotten about the incumbents that were thrown out of office by gun owners last fall! And they know that backing pro-gun legislation is just smart politics, especially here in the Midwest. But we have to keep the pressure up! Today, with the next session of the Iowa General Assembly only a few months away, I’m really counting on your help. My goal is to generate at least 100,000 petitions from Second Amendment supporters insisting that politicians in Des Moines take action on Constitutional Carry. >>> Hard-hitting TV, radio and newspaper ads calling out anti-gun politicians who oppose Constitutional Carry. So please, take a moment to sign your petition right away! Trust me. This will get the politicians in Des Moines to listen. But I’m counting on your support to make it happen. We spent a tremendous amount of the resources that we had last fall and last session in our successful fight to expose anti-gun incumbents and pass Stand-Your-Ground law. Now we have to rebuild our war-chest. Every dollar you can give will go towards helping Iowa Gun Owners build support for Constitutional Carry — so I hope you’ll be generous. It’s up to you and me to wipe these infringements on our Second Amendment rights off the books here in Iowa. If you agree, please sign your petition and submit them to Iowa Gun Owners IMMEDIATELY along with your most generous contribution of $100, $50 or at least $25 TODAY! P.S. If passed, the Iowa Constitutional Carry Bill would restore the right of every law-abiding citizen to carry a gun to protect themselves and their families — WITHOUT going through a bunch of bureaucratic rigmarole! I believe we can make Constitutional Carry a reality in Iowa, just like we did with Stand-Your-Ground law. But it won’t happen without you. Please sign your petition today, in support of this critical legislation! And please also consider your most generous contribution of $100, $50 or at least $25 to help us mobilize more gun owners TODAY!